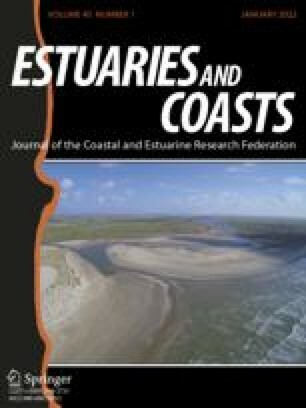 From September 1994 through October 1995 aboveground and belowground production ofSarcocornia fruticosa andPhragmites australis was studied at two sites in the Po Delta. In 1995, aboveground production forS. fruticosa in an intertidal site was 678 g dw m−2 yr−1 with a peak live biomass of 1,008 g m−2; belowground production was 1,260 g m−2 with a peak live biomass of 3,735 g m−2. A litter bag decomposition study showed that after 69 wk there were 3.7%, 64.3%, and 66.6% of the original mass of leafy stems, woody stems, and roots, respectively. In a reed bed, which experiences brackish conditions,P. australis aboveground production was 876 g m−2 with a peak live biomass of 780 g m−2; belowground production was 2,263 g m−2 with a peak live biomass of 4,087 g m−2. After 65 wk, there was 45.4%, 50.4%, and 29.3%, respectively, of leaves, stems, and rhizomes remaining of the initial biomass. At both sites, regular submersion by salt water probably leads to lower aboveground biomass and higher belowground biomass than reported for other Mediterranean coastal sites. The high belowground biomass can contribute to accretion to offset rising sea level.